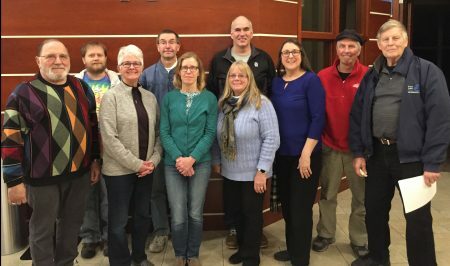 The Prior Lake-Spring Lake Watershed District Citizen Advisory Committee (CAC) consists of residents who provide input and recommendations to the Board of Managers on projects, reports and prioritization and act as the primary interface for the Board to address the current issues of concern of the local citizens. There are currently eleven citizen representatives on the CAC. Current members are listed here. The CAC meets monthly on the last Thursday of the month at 6:30pm at the Prior Lake City Hall, located at 4646 Dakota St. SE, Prior Lake, MN 55372. CAC meetings are completely open to the public. Please feel free to join us for future CAC meetings. Previous CAC meeting minutes are available on the CAC Meeting Materials & Minutes page. Current CAC members are: (Left to Right) Jim Weninger, Adam Fitzpatrick, Marianne Breitbach, Steve Pany (Chair), Liz Schramm (Vice Chair), Jodi See, Jerry Mealman, Kim Silvernagel, Woody Spitzmueller, Roger Wahl. Not pictured are Paul Krueger, Jim Goodchild, Joe Schramm, Larry Rundell. If you are interested in joining the CAC, fill out an Application and return it to Diane Lynch. Members must reside within the Watershed District and are appointed by the Prior Lake-Spring Lake Watershed District Board of Managers. For more information about the Citizen Advisory Committee, please contact District Administrator, Diane Lynch at 952-440-0067 or dlynch@plslwd.org.